Dr. Elise Sadoun, MD is a Board-Certified Family Physician, and is also a Board Certified Weight-Loss specialist. She graduated from the Ohio State University with her Doctor of Medicine degree, and her Bachelor of Science in Psychology degree. Her philosophy of care is that the medical practice must center on the patient's needs and unique medical conditions. Treatment plans should be personalized for each patient. She believes in the ideals of Humanism in Medicine, and that all life is precious. She provides full service Primary Care for ages Newborn to Seniors, including many In-Office Procedures, Women's Health, Men's Health, Preventive Care, Travel Medicine, and Weight Loss Treatment. Our caring staff is dedicated to your health and comfort. After you book an appointment on ZocDoc, our patient portal system will send you a confirmation email with access to the portal. Please go to the portal and complete your patient profile to save time at your scheduled appointment. Welcome! Dr. Sadoun is very knowledgeable and friendly. She genuinely seems to care about her patients and takes the time to listen to all of your concerns. She’s great! She is SO nice and personable. I moved to TX from a different state and thought it would be impossible to find a great PCP. But Dr. Sadoun is amazing! She is extremely knowledgeable and so caring/friendly. You will love her. My visit with Dr. Sadoun was a thorough process. I went in to get checked in for an annual heck up and to make sure I was alright after a concussion. She made sure that everything externally and internally was normal.After a couple of tests being done, she came in and was interested in more detail of what I felt and answered all my questions. Dr. Elise was personable and open with me. She gave me lots of options so that I could make the best decision. The entire staff was friendly and I look forward to her being my doctor. Great bedside manner and genuinely listens to your concerns. Excellent! Kind and she explains everything and she’s very thourough. Very happy with my experience. It went great! I initially came in for one thing and she helped me with so many others that other doctors would avoid speaking with me about. Very appreciative and greatful I found her!!! Very kind doctor. She spends plenty of time discussing history, concerns and treatment options. Never felt better while in the care of a doctor. She made me feel comfortable and cared for which I have not really experienced. I highly recommend her. I didn't have to wait for to long. They have automated check in which is great because you can take care of your office payment quickly too. Staff is great, they took their time with me as well. Dr Sadoun isfantastic. Listened to ALL my issues and suggested remedies accordingly. They followed up the next day as well. Most pleasant experience I had at a physical. Great doctor and enjoyed speaking too. I will refer some friends to her as well. I love how everything is electronic. The whole process was easy. She was worth the wait! Explained everything she was going to do before and while giving the exam. Answered all my questions and made me feel very comfortable. Usually I’m in panic mode when I see doctors. But I will definitely be going back! Definitely recommend her! I love that place the entire staff is amazing and very understanding! She’s amazing! She really listens & wants to help. This is the doctor who really cares, listens and bonds. Finally we have a family doctor.. a great family doctor! Amazing Dr and very sweet staff. Very attentive and thoughtful. Really takes the time to listen and explain her treatments. All Staff was Nice. Dr. Sadoun was thorough. Appointment went Great. Thank you. Very Pleased. Dr. Sadoun is Amazing. Her Staff; Polite and Professional. Dr. Sadoun is very patient and understanding. She listens carefully. Your appointment isn't rushed. I explained to her all symptoms I was experiencing; she consultedme, ordered all necessary labs, and I'm scheduled for follow up. I finally found a Great PCP. I'm Home Now. Thanks to Dr. Sadoun and her staff. She was very informative and gave me tools to help me lose weight in a healthy way. Check in was very efficient and quick.. Dr Elise was professional and timely. Dr. Sadoun was awesome! Friendly, down to earth, and easy to talk to. Excellent!! Dr Sadoun is kind, patient and knowledge! I cannot speak highly enough about this physician. She was very patient and answered all of my questions. She went through my family history with me and was able to identify the potential cause of my migraines. I am very excitedto begin working with her on my health. I felt through the whole appointment that this is someone who really cares for her patients. From the person at the check-in desk to the nurse who initially took my vitals, every member of this team is friendly and extremely professional. Highly Recommend!!! Stuff are very nice. Fast. She is very personal and thorough every time I see her. She will be my doctor for life. Dr. Sadoun's practice implements many electronic devices that make medical records easily accessible and accurate. I love the use of the user friendly tech. Dr. Sadoun herself is lovely and makes a patient feel human instead of another name on a sheet of paper. I did not care for the student nurse practitioner that I had to see in between the nurse and doctor. It would have been nice to have been asked if I wanted her to question/examine me. Highly uncomfortable. Only my second visit with her but she has put my mind at ease. I did wait to see Dr. Sadoun, but it was because she takes her time to address her patients' needs. I wasn't rushed once she came in to the room, and it didn't seem as if other patients were rushed through. Very nice! My whole family has been going to her for the past 2 years we would not wanna change Dr ever. I will never have another physician, she is amazing and you immediately feel important to her. Her staff are all very nice and helpful. She's wonderful! She reallylistens to your concerns and finds the best way to help. Very easy to talk to and she said she accessible always for her patients which is very important for me rather than depending on ER or UCCs. Dr. Stadium was very personable! She asked a ton of questions to make me a little more comfortable while also gaining knowledge about my health! I was very pleased with my visit! 5 stars across the board (friendly staff, short wait time, quick availability, great bedside manner, etc). I was looking for a new primary care physician with a certain specialty and she definitely seems to fit the bill. Not sure what happened with her, but my two visitors with her were like night and day. The first visit she was very informative, helpful, kind. Then the second follow-up visit she undermined and basically lectured me for something that wasway out of my control. I came to follow-up about one condition and she was so busy lecturing about the other, we never even got around to following up about the reason I was there in the first place. I will make a point to let her office know that it is highly unlikely that I doubt I will be back. I have a bad pain issue going on today and would rather start the new patient process over again with another PCP than give her my business. It was my first appointment, so I think that's why my wait time seemed long. Everything else was great! Everyone was so friendly! I was able to take care of everything I needed! It was good. Dr. Sadun is a good listener. Dr. Sadoun is incredibly kind and attentive. She immediately made me feel at ease and is incredibly thorough. Highly recommend! I really like Dr. Sadoun. She's very very personable and knows what she's doing. If you have been looking for a good doctor for years just like I had look no more. Dr Sadoun is the kind of doctor wjo really cares. she always takes the time to understand what is wrong, she is kind and her staff is amazing! “Dr. Elise and her team is hands-down and one of the best medical doctors I have seen in my 39 years of life! Her demeanor and bed-side manner is calm, positive, thorough, attentive, flexible, and personal. I saw her for afew medical issues. I find that doctors usually are distracted or rushed when visiting their patients, but not with Dr. Elise. I had the sense that this doctor REALLY cared about my whole being and not just the fact that I needed work done. Additionally, I could tell that Dr. Elise has a well-rounded medical background and approaches her care with a western and eastern perspective, not the typical medical “fix it and get rid of it” approach. I'd definitely recommend this practice to anyone that values their health and wants a doctor that’s holistic, empowering, and a true team player! Although the wait was a bit long, once you meet the doctor all is forgiven. I have never had experienced with a doctor that made me feel like her time was specifically for only me. She made me feel comfortable. Shewas wonderful. She was also very knowledgeable and confident. Would definitely go again. She was very polite and was so excited about me becoming a new patient of hers. I can tell she really cares about her patients well-being. I am very excited to call her my new doctor! I had my first visit with Dr. Sadoun and she was more than helpful! I had a list of ailments to talk to her about and she patiently listened and advised me on each of my concerns. I didn't feel rushedlike I was taking up too much of her time. She gave me more information than I've gotten from my previous doctors on the same subjects, and was very thoughtful and kind. I am very happy to have found her on Zocdoc and will continue to use her as my primary physician. 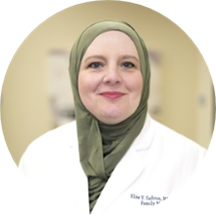 Dr. Elise Yasmeen Sadoun, MD has no appointments on Zocdoc right now.